Soon after the Blisses purchased Dumbarton Oaks, they demolished the barn, which was located north of the Orangery, and began the conversion of the stable yard into a Green Garden, which would in a sense be a part of the rooms looking out on it . . . and attractive throughout the winter. The Blisses visualized the garden as an outdoor entertaining area beyond the Orangery. This terrace, at the highest elevation of the property, allows views over the garden terraces below to the hillsides to the north and the city to the east. Paths lead from the Green Garden to the Beech Terrace, the Pebble Garden, the North Vista, the Star Garden, and the Swimming Pool and Loggia. 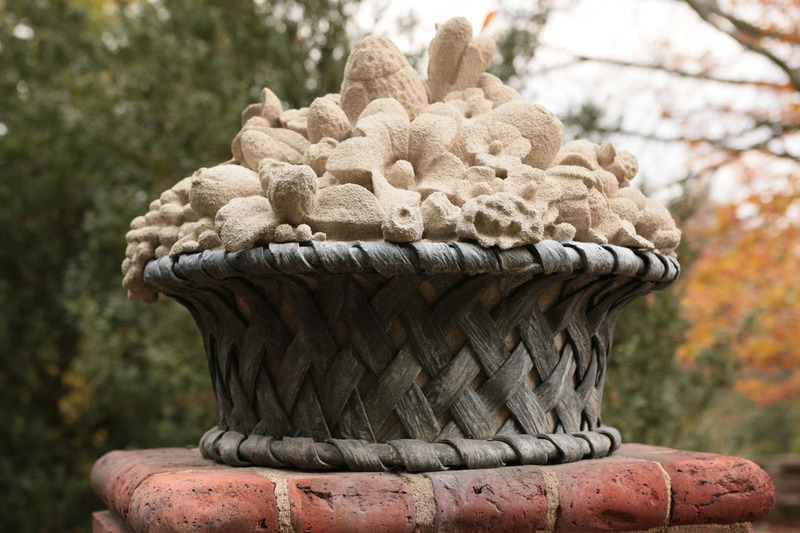 Basket of flowers ornaments (one of four), limestone and lead, Beatrix Farrand, Armand Albert Rateau, ca. 1930.